Where life and food come together! I have neglected my blog for far too long! I of course have been cooking and even picturing all the items, I just haven’t got around to blogging them! Today however, I made something that is just so incredibly amazing I have to blog and share it! I’m fearless when it comes to cooking, I feel like I can conquer anything in that department but I don’t give myself enough credit in the baking department, although what I do bake usually comes out great I feel that baking just requires so much precise measurement and exact detail that I allow it to scare me, crazy, I know! Well, after tonights brownies, I’m up for some baking challenges! My ovens and huge kitchen in our new house make my love of the kitchen even fonder! I was sipping a Nutella Latte in my favorite local coffee shop yesterday and was thinking how much I have missed Nutella! I went through a severe Nutella obsession after discovering it several years ago and actually burnt myself on it for awhile, but the craving is back. That latte got me thinking and while sitting there I thought how great Nutella would be in Brownies! We love brownies in our house but I have always just stuck with making box mixes, sometimes adding in extras and they are always so yummy! I got to thinking that I wanted to attempt making my own brownies from scratch! I sat down, concocted up a recipe, did a little research, crossed my fingers and said a little prayer and went to work! I think it was the prayer that worked because holey stinking moley they were better than I could have ever imagined. Seriously, I MADE THESE?! They could have come straight out of a bakery! So I have to share! Here we go! Preheat oven to 35o degrees. Grease the bottom of your brownie pan. Melt butter in a large pan over medium heat, add cocoa and baking soda and mix together. Stir in sugar and eggs one at a time. Add the rest of the ingredients and blend well. It’s going to thicken quickly so make sure to have all of your ingredients out and ready to go. Pour mixture into brownie pan and bake for 3o minutes or until done. Beat all together until smooth. 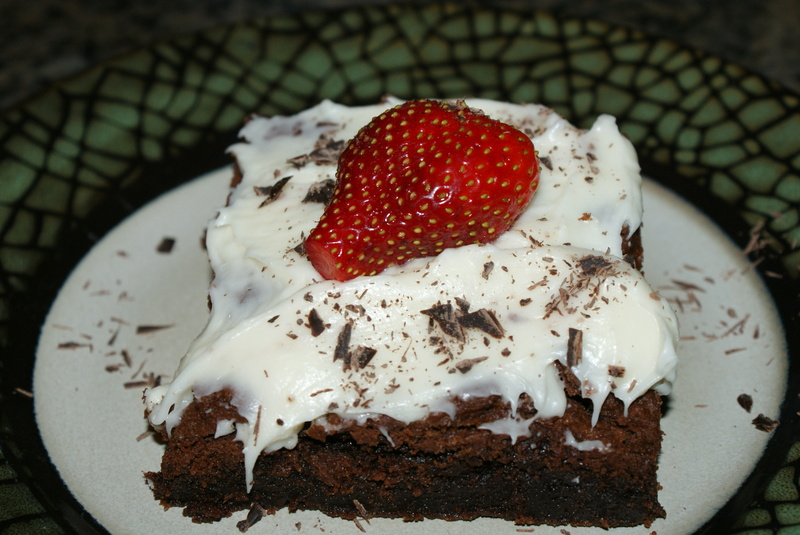 Once the brownies have cooled, top with this yummy frosting, shave some of the bakers chocolate onto each brownie with a knife and top with a fresh strawberry. I literally cannot describe how good these brownies are, for real, I’m for once at a loss for words! But they are very very rich thankfully so you most likely won’t want to eat the whole batch in one sitting! Enjoy and please post a comment to let me know what you think! I almost always have a craving for Nutella! 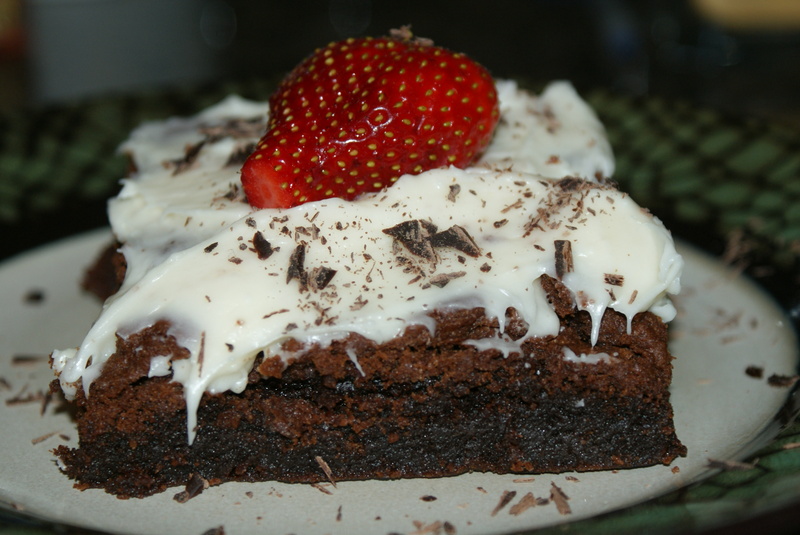 Lovely brownie recipe…I’m certain these would be very well received in our household!